Senior Pat Lutz contests the ball with a Knight opponent. The Sweet 16 match brought out record attendance and support for the Tartans, who this season qualified for the round for the first time in history. Sophomore Ian Epperson glances down the field for an opening. The Tartans fell 1–2 in a heartbreaking match against Calvin College, but nonetheless have much to be proud of this season. If you weren’t at Gesling Stadium last Friday evening, you missed out on a very memorable night at Carnegie Mellon University. The men’s soccer team, who had a terrific season overall after finishing first in the University Athletic Association (UAA) conference and setting multiple records, unfortunately weren’t able to progress to the Elite Eight of the NCAA tournament. Nonetheless, this was quite the milestone for Carnegie Mellon, and our university was blessed to have one of its largest and loudest crowds come out to support the men’s team. The large and rowdy crowd wasn’t just a result of giveaways from the university. 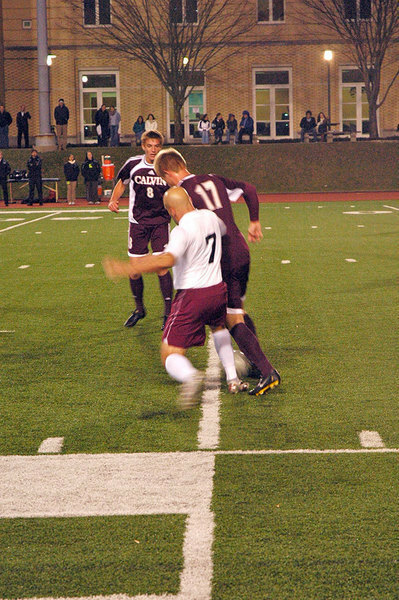 It was the impressive play of the men’s soccer team throughout the year that gradually attracted more and more fans. For the first time in school history, the Tartans advanced to the Sweet 16 of the NCAA tournament. Senior center-back Jon Hall was named to the ESPN the Magazine Men’s Soccer First Team Academic All-American of the Year for the second consecutive season; joining him on the first team for the first time this year were fellow seniors Ryan Browne, Ricky Griffin, Austin Good, and Keith Haselhoff. Meanwhile the senior offensive trio of Griffin, Browne, and Pat Lutz combined for 38 goals for the season. 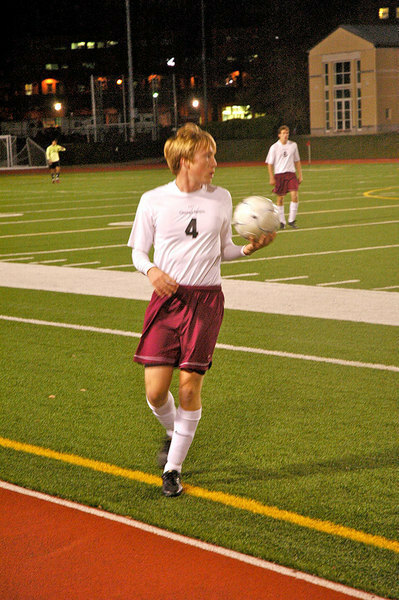 Griffin himself had 19 goals, putting his career total to an outstanding 51 goals, including a record five goals against St. Vincent’s College, and collected his second consecutive UAA Player of the Year award. Both teams came out playing disciplined defense, but unlike at other Carnegie Mellon home games, the Tartans weren’t able to attack with the same force. Two players seemed to be constantly covering Lutz, and Griffin couldn’t seem to find the space that he usually sees. As a result, most of the game was played in the midfield. But late in the game, Calvin College found a way to get through to the Tartans’ end of the field and win a throw-in. Given that rare chance, Calvin made no mistake in taking advantage of the opportunity. One flick after another in the Tartans’ box led to a goal by Calvin substitute Chris Nance. Immediately, Carnegie Mellon’s head coach Aaron Lujan brought on sophomore forward Brad Edelman in hope of more attacking play. As the Tartans pushed up in search for an equalizer, Calvin College found Carnegie Mellon out of position and scored a second goal. As all hope seemed to fade away, the persistent attackers for the Cardinal and Gray were able to notch their first of the game just 30 seconds later. The Tartans continued to press and nearly got a late tying goal late in the 89th minute when they were awarded a free kick just outside the Calvin box. Browne, who has had a sensational NCAA tournament, curled the ball to the far post, but Calvin College’s quick goalie Ryan Bratt just got his hand to the ball and swatted it away to clinch the game 1–2 for the Knights. Despite having one of the best teams ever to play at Gesling Stadium, Carnegie Mellon must now look forward to next season. With the current underclassmen showing much promise and a student body that proved that it is very much alive, the Tartans will look to build upon this year’s success in 2010.